Everybody wants to maintain a garden in their backyard which is planted with various flowers and which caters to the environment. Maintaining a garden only is not sufficient because there should be garden furniture’s to get along with it. It is a common practice among families to organize any party or function in their backyard, which is why it is important to install furniture which suits the outdoor spacing and where the seating arrangement in the garden can be done in a proper manner. Though it might seem easy, installing garden furniture might be a tricky task in matters of choice and variety. In matters like these, rattan garden furniture is the best choice or variety because these types of furniture’s are made from rattan, which are finely combined stems of palm, which is usually used to make furniture’s which are especially suited for a garden. You can choose from a wide variety of rattan furniture which is combined with aluminium, recycled teak, recycled plastic, etc. The different types of furniture in rattan include the Havana range which consists of an aluminium frame which is sturdy in order to maintain the strength and integrity, the woven synthetic is of natural colour which is very smooth to touch. The rattan furniture’s are usually weather resistant, i.e., the furniture can be left outdoors in any weather condition, the furniture can also withstand mold, insects, fungus, termites, etc. There are also Cleo rectangle dining tables which come with 6 chairs, it has granite tiles on the top where the weave is available in cappuccino or natural rattan or ecolene weave. There are also garden swing seats which are of 2 seater, 3 seaters, and 4 seater where the 3 seater and 4 seater comes with a built-in footrest, which is very strongly built for domestic or commercial use. A headrest is also available and a new feature can also be seen where the swing can be pinned to a frame, which will help the swing be in a stationary position. The swing also has sides which are curved and are attached to a platform so that there is a wide base which is a solid foundation for everlasting quality and maximum stability. The swing also has an over-head hood that provides shade when required. There are side tables available on both-sides where drinks can be kept, while you can sway gently. 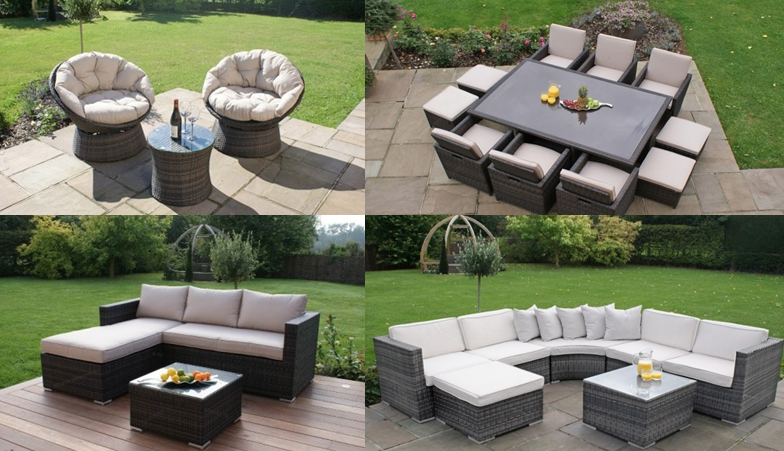 Garden Furniture Spain is the leading provider of outdoor rattan furniture since 2008, where they have one of the largest stock holdings of high-quality garden furniture in the entire country. They specialize in teak furniture and also provide high-quality outdoor extras like parasols, patio heaters, hammocks, shade sails, Barbecues, picnic tables, Gazebos Awnings, etc. Their web-based business has sold furniture across Europe and has adapted to changes according to the trends, where they innovate with their furniture and offer a wide variety of above mentioned garden furniture and swing seats which are of affordable price and high quality.